This delicacy probably came with the Sephardic community, via Poland from the Middle East to Europe. Also in America is it a well-known cookie. The mother of my Polish student knows this pastry-like cookie as “Rogalik”. 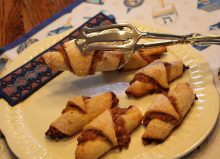 In Yiddish Rugelach means “hornshaped”. In some books is written that Rugelach belongs to Hanukkah. The horn points often to victory; so here the victory of the Maccabees over the Greek-Syrian oppression. The special dough has a part of soft cream cheese. The filling can be made of traditional walnut-cinnamon-raisin mixture or from apricot, raspberry and even from chocolate. 1. For the dough: Beat the butter and cream cheese together until smooth and light. Add the tablespoon sugar, egg and salt. Mix well. 2. Stir in the flour with a tablespoon or spatula. Form a soft not sticky dough. Maybe you don’t need all the flour. 3. Form a ball, covered with foil and let it rest for 2 hours or better for a whole night in the refrigerator. 4. Grind the walnuts in the kitchen machine and set aside. Then crush the raisins small in the kitchen machine, but only use the pulse button just some moments. Mix together: cinnamon, 180 gr. / about 1 cup fine cane sugar, the grinded walnuts and the crushed raisins. Divide in 6 balls and set aside. If the balls fall apart, don’t worry. If the result is firm, you can roll each ball in between two peaces of kitchen foil and roll out until a smaller diameter as the round of dough. Or you could smear the filling over the with butter covered dough. 5. Preheat the oven to 180°C / 350°F. Cover 2 baking sheets with baking paper. Sprinkle some flour over the countertop. 6. Roll out one ball of dough (keep the remaining refrigerated) into a 10 inches diameter and 3mm thick round dough. Smear with the melted butter. Next layer is 1/6th or 1 ball of the filling. Then cut int 8 equal wedges. Starting at the outside edge roll up each wedge and place on the with paper covered baking sheet, point side down. Make about 3 rows of 8 pieces. 7. Smear the cookies with melted butter and sprinkle with fine sugar. Place one sheet at a time in the middle of the preheated oven and bake for 25 minutes. After these bake the 2nd sheet. Have a wonderful feast and enjoy the Rugelach!